In An Aging Nation, Making Stores Senior-Friendly Pumping music, heavy doors and slippery floors are just a few things that make a store less inviting to senior citizens. As their sector is set to grow in the next decade, some retailers are starting to make spaces more welcoming to this consumer group. Retailers are paying special attention to older shoppers these days. Within the next decade the number of people older than 65 is set to jump almost 30 percent. That shift has store designers thinking about how to accommodate the millions of older shoppers who'll be streaming through their doors. But what could be wrong with a fully stocked supermarket, typically filled with enticing displays, numerous aisles and gleaming floors? The older we get, says retail anthropologist Georganne Bender — just about everything. Take the floors, for example. "Retailers love shiny floors," she says. "But shiny floors are scary to somebody who's not sure if it's gonna be, you know, slick footing for them." Any spill can make walking treacherous. Then there are the products. Half the population over age 65 has some kind of arthritis. A lot of younger people have it, too. With this ailment, reaching and bending get harder. The National Retail Federation says its members are on the case, but Bender says so far there has been more talk than action. Drugstore chain CVS, though, has made changes. "They're resetting their counters, not putting things too high or too low," Bender says. "They're putting carpeting in the store." 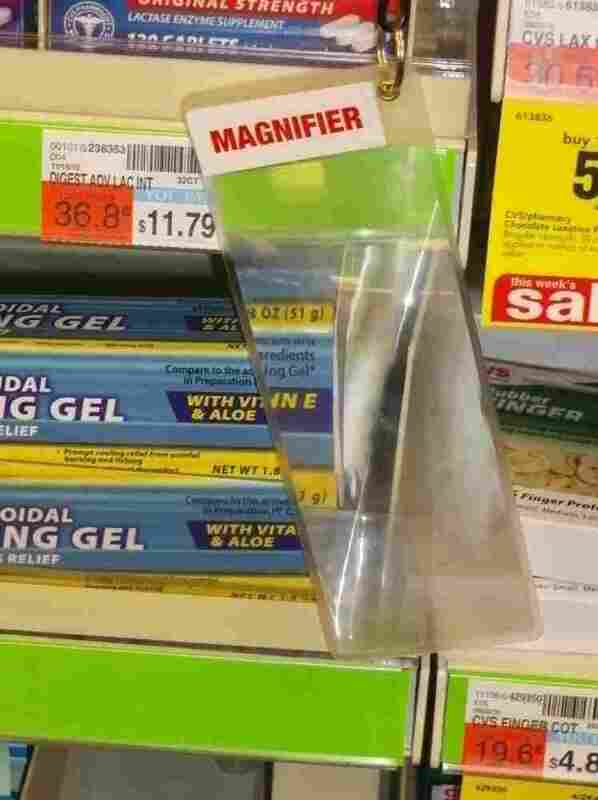 CVS and Walgreens also have magnifiers hanging from shelves so shoppers can read the fine print on packaging. But in New York, at least, some basic things are problematic. Robert and Ronnie Rubin, retired teachers in their late 60s, point out that while some stores have automatic doors, plenty don't. "You need to be Hercules to open the door," Robert says. "Robert and I have more than once gone over to assist someone in opening the door because they just couldn't get it open," Ronnie says. "We're fortunate we're still healthy enough to be able to do these things." But there may come a time when they'll benefit from a store designed with their needs in mind. Rosemary Bakker of Weill Cornell Medical College is an interior designer and gerontologist. She toured a store the New York City Council has called age-friendly — a Whole Foods Market on Manhattan's Upper West Side. But Bakker noticed something age-unfriendly almost immediately. "This music is geared for a much younger audience," she says. "I find it, with this very low beat, very distracting. So I want to come in here and shop, but there's this drumbeat going on and I feel like I'm in the wrong environment." She says anyone with cognitive difficulties would find the visual stimuli of the displays, combined with the music, too much to handle. In fact, a 79-year-old across the street said she avoids the market for that reason. On other fronts, though, this Whole Foods does well. It has wide aisles, good lighting and helpful staff. The signs are easy to read. Bakker notes the utensils at the salad bar. "I'm looking to make sure that I can easily grasp things if I might have a little arthritis in my hand," she says. "They have nice-size handles here for me to pick up." On her wish list: carts with built-in seats so weary shoppers can take a rest. Some supermarkets in Europe already use these. Bender, the retail anthropologist, says that whatever help stores do offer, they should be subtle about the service. Never make a customer feel old. A&P supermarkets recently started a loyalty program for shoppers over 55. "They called it a senior discount," she says. "Well, I'm 55 years old, and there's no way that I'm a senior, and I'm the kind of person that, I don't even want your discount if I have to have the senior citizen card." If the chain comes up with another name, though, she might consider it.